It’s here. The start of my race season. 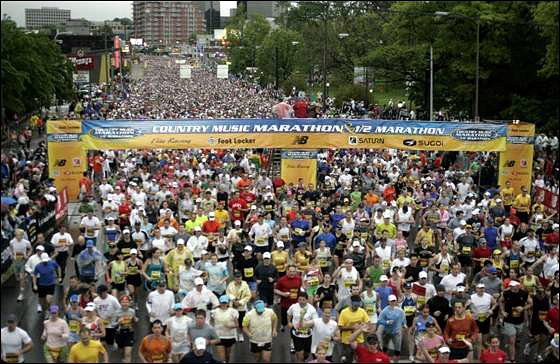 Tomorrow is my first half marathon of 2013: The Country Music Half Marathon, a.k.a. Rock n Roll Nashville. On the one hand I’m excited because I know I trained well, this is one of the largest half marathons in the U.S., and I might be a tad obsessed with Nashville lately thanks to the TV show on ABC. On the other hand, this is not going to be pretty; I’m just getting over a cold and can barely breathe through my nose let alone move 10 paces without blowing my nose, and, oh yeah, it’s going to be raining the whole time. Argh! I guess half marathon number five, it was bound to rain on me sooner or later. Any tips for wet weather running? So that makes this Fired Up Friday extra important because I will need extra motivational music to get me through. Thankfully, I have the new Fall Out Boy album locked and loaded on my iPod. I was knew as soon as I hear it that “My Songs Know What You Did in the Dark” would be my theme song for this first half marathon of 2013. Even when I’m not running and I hear this song, I can feel my feet pounding on the pavement. It lets me block out everything around me. Let’s hope that includes rain and mucus on Saturday.